Here are some of my photos from last Friday’s #FriFotos theme: colorful. This week’s theme is roads. Start posting your road photos on Friday, June 12, 2015! My first trip to Ireland was in March, and I was there for St. Patrick’s Day. 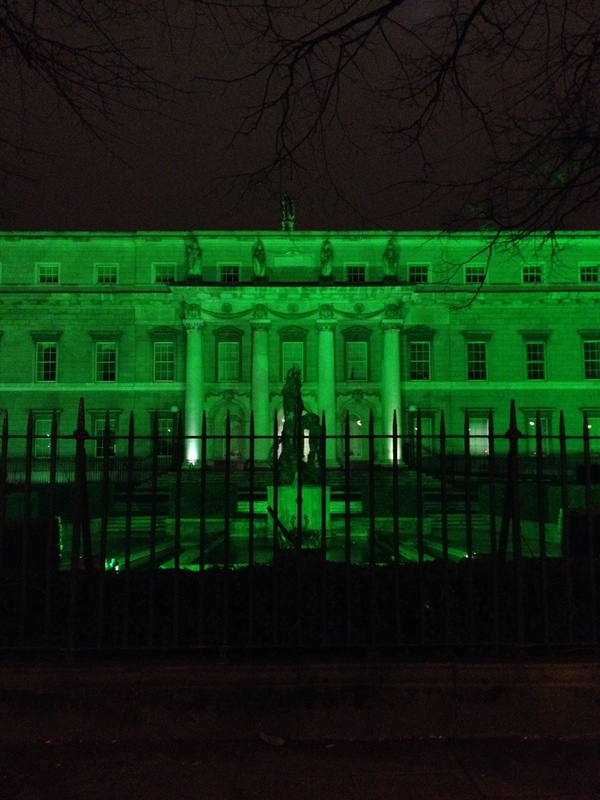 Many of the buildings around Dublin were lit in green for the holiday as part of Tourism Ireland‘s campaign to #GoGreen4PatricksDay. My friend Claire first told me about Liberty London when I was planning my first trip to London about fifteen years ago. 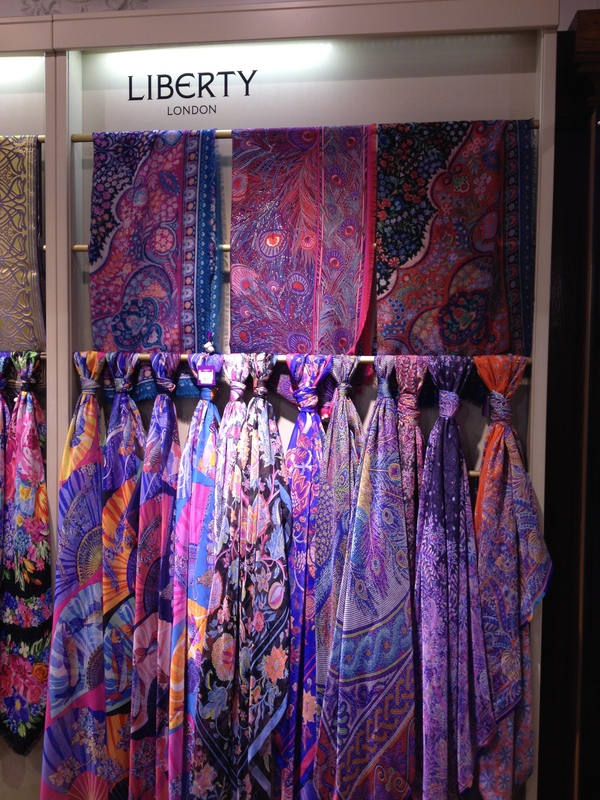 After almost yearly trips to London, I had not visited in almost nine years, so when I arrived, one of my first stops was to visit Liberty and see their iconic prints – on scarves, on blouses, dresses, notepads, cards and makeup bags. I will be back in London in July, and I will be sure to visit Liberty again (the store itself is beautiful too). While in London, I also visited another iconic department store, Harrods. The food halls at Harrods offer just about anything you can imagine, and I enjoy walking around to see the delicious foods and desserts. 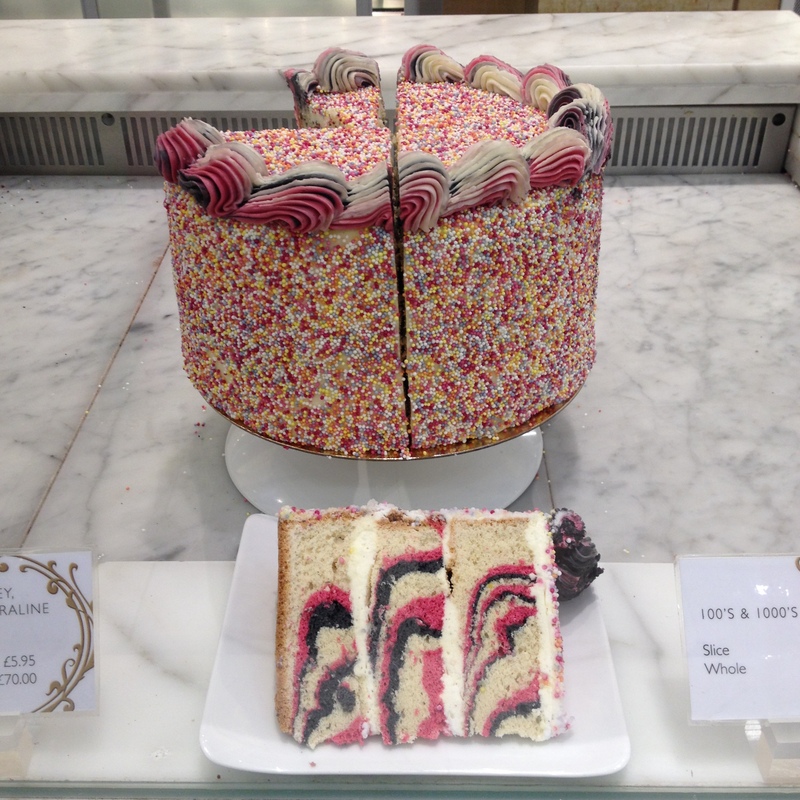 This marble cake looked particularly pretty. During my trip to Britain in April (see Liberty and Harrods photos above), the weather was beautiful. I think I only used my umbrella one day during my fourteen day trip. When we arrived in Edinburgh, Scotland, after a long day of driving, I needed to stretch my legs. Luckily, our hotel was near the Scottish Parliament building, and close to Holyrood Park. 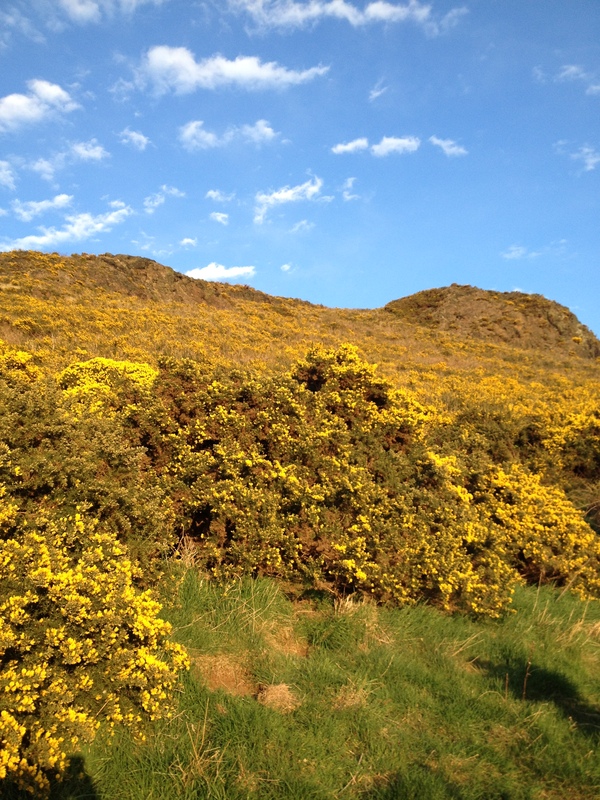 Even though it was late afternoon, I was determined to climb to Arthur’s Seat. It was windy and chilly, but perfect weather for walking, and the light was spectacular. Climbing to Arthur’s Seat in Holyrood Park. My final photo is one my friend Laura took. Over Memorial Day weekend, three of my high school girlfriends and I traveled to New Orleans for a girls weekend. On our final day, we went to Commander’s Palace for their Jazz Brunch. 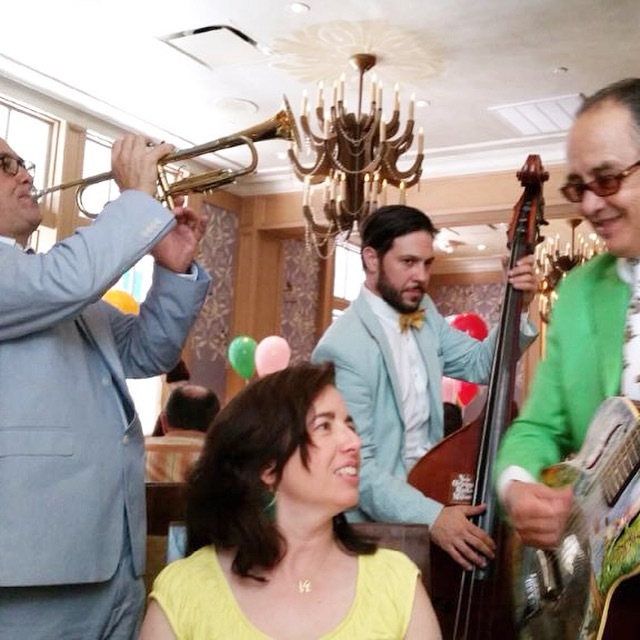 As the jazz trio played for our table, Laura took this picture of me surrounded by musicians, a colorful way to end our weekend of fun! Jazz Brunch at Commander’s Palace. #FriFotos was started on 15 October 2010 by Jonathan Epstein (@EpsteinTravels). Jonathan is the President and Owner of Celebrated Experiences, a company focusing on travel to the UK and Ireland. He is passionate about photography, his favorite hobby. Each week Jonathan cohosts #FriFotos with Stephanie Diehl (@TravelDesigned), Charles Yap (@CharlesYap), and Spencer Spellman (@SpencerSpellman). Jeffrey Epstein (@jeffreyinmotion), CEO of HBIM was a key advisor in the creation of #FriFotos and continues to assist in the Forum’s growth and success. This entry was posted in Dublin, FriFotos, Ireland, London, New Orleans, Scotland and tagged Edinburgh, FriFotos, KREuroSpring, KRinIreland, KRinNOLA, London, New Orleans, Scotland by Kiera Reilly. Bookmark the permalink.